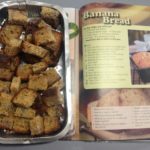 In our ‘My Read at Home’ book there was a banana bread recipe. It looked nice but Dylan told us his mom bakes better banana bread and her recipe is the ‘best in the world’. To prove this Dylan asked his mom to make banana bread for everyone to try. His mom baked banana bread on not one but two occasions for us all to enjoy. 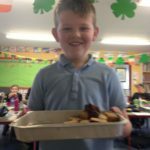 Even the teachers tried some and said that Dylan was right that his moms banana bread is ‘YUMMY’. Thanks to Dylan’s mom from everyone in his room.